Students and teachers at a high school in Granada Hills were greeted with the thrill of a lifetime when a mountain lion roamed onto campus on Friday morning. 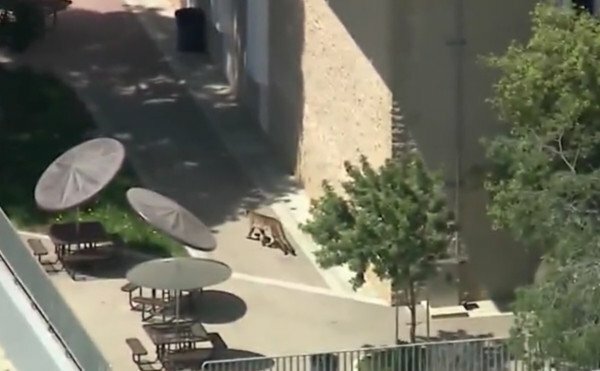 The scene at John F. Kennedy High School was captured by overhead film crews as the big cat scrambled through the hallways and outdoor seating areas. School officials put the campus on lockdown as law enforcement responded. Officers called to the area were able to tranquilize the animal where it came to rest in a neighbor’s front yard. It was quite a morning of drama for a neighborhood that has increasingly had run-ins with the dangerous predators. In a study last year, it was discovered that roughly half of all cougars had eaten cats or dogs.